This article is intended to assist you with setting up port forwarding on your Yealink phone. Please read this guide if you need further help with port forwarding. 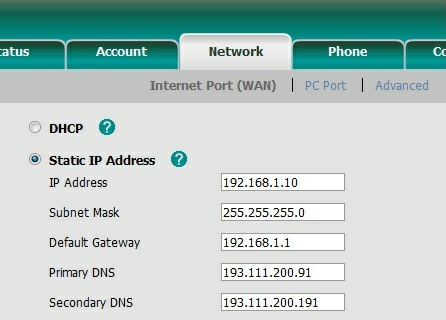 Once logged into the device, click on the Network tab at the top of the page and enable Static IP Address. From here you will need to enter your network details. We have provided an example below. Once you have entered these details, click on Confirm button at the bottom. The phone will then reboot. Once the phone has been rebooted, click on the Advanced Settings tab at the top of the page. From here you will need to enter the local RTP port (by default this is set to 11780-11800). If you have multiple phones then the ports will need to be staggered in intervals of twenty. For example, the first phone would use port 11780-11800 and the next phone would then use 11820-11840, and so on. Please see this article for more help with this. Click on the Account tab at the top of the page, You will now see the option local SIP port section next to the SIP Server. The default SIP port is 5060. Please note that if you have multiple phones you will also need to edit the Local SIP Port setting (found by clicking Advanced on this page). On each phone you will need to assign a unique SIP port to each phone, staggering in increments of two. For example, the first phone would use port 5060 and the next phone would use port 5062 and so on. Please see this article for more help with this. When you are done, click Confirm at the bottom of the page.